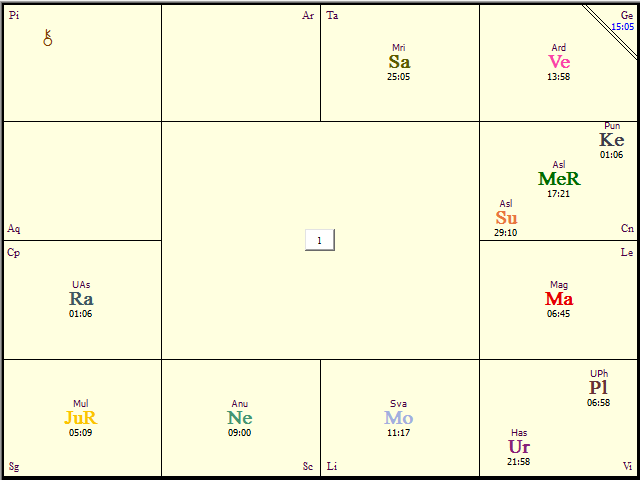 At first glance, Ben Affleck’s chart looks like a dream come true. Venus is right on the ascendant in the intelligent, creative sign of Gemini, opposite Jupiter in its own sign of Sagittarius and trining a 5th-house Moon in Venus’s own sign of Libra (in the nakshatra of Svati, which is often associated with the wealthy and socially adept). Mars is located in his 3rd house, which has a strong connection to the arts, and is in the sign of its great friend, Leo (which, once again, represents the arts). In other words, it’s a fitting chart for a multimillionaire movie star who is also sharp enough to become an elite screenwriter and film director. He’s also had one of the most unlikely career trajectories in film history. He was celebrated as a screenwriter in his 20s, unfairly mocked as a tabloid headline for years, reemerged as one of the world’s top directors (and, suddenly, a respected actor), won an Oscar and now his pending divorce is all over the news, with most accounts essentially blaming him for drinking and gambling away his marriage. Of course, who knows if that’s true? However, the point is that it’s on every supermarket shelf, and while it’s likely especially personally painful for Affleck, it’s really just a dip on the Rahu-driven rollercoaster he’s been riding for a long time. Rahu is the north node of the Moon and considered especially troublesome in Vedic Astrology. It represents our insatiable desires – the areas of life we are relentlessly compelled to experience but must eventually realize are maya (illusion) to continue on our spiritual path. Rahu is specifically responsible for all forms of mass hysteria, which include both fame and public derision. So far, I’ve done celebrity profiles on Woody Allen, Taylor Swift and Affleck and I’ve ended up writing about Rahu extensively in each one. None of these people were originally chosen to profile with the idea of focusing on Rahu, but it turned out to play a huge role in all of their lives. Affleck’s Moon nakshatra of Svati and his Ascendant and Venus nakshatra of Ardra are all ruled by Rahu, so it’s bound to be a substantial influence throughout his entire life. As it’s placed in his 8th house, it represents sudden ups and downs, secrets and the esoteric or occult. 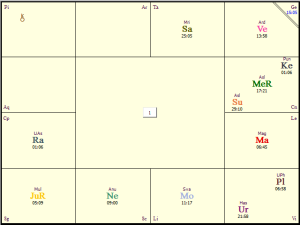 Since the Moon nakshatra determines which mahadasha (major period) one experiences first in life, Affleck grew up during a Rahu mahadasha; then he initially became famous during the mahadasha of his strong 7th-house Jupiter in Sagittarius and antardasha (sub-period) of Rahu. In this instance, Jupiter, which is generally considered the planet best able to work with Rahu’s energy, was able to channel the more positive elements of Rahu into a sudden rise.